Paper covered cardboard gift boxes with white wadding. Simple box for earrings. Quick dispatch time. 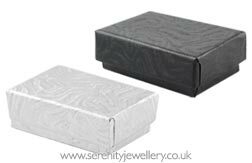 I purchased this box to hold my tragus and helix hoop rings when I fancy a change of colour. A very pretty little box to put my granddaughters earrings in. She was delighted with it. 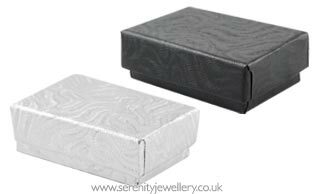 Neat little box to "wrap" your earrings in if you intend them to be a present. Lovely little box that really showed off to perfection the earrings that I bought for my daughter's birthday. Very pleased.